According to Vatican News, on January 9, Francis used the occasion of his Santa Marta homily to speak about authority; both that of Jesus Christ and that of the pastors of the Church. What “gives authority” to Jesus, the Pope explained, is precisely his closeness to the people, because he understands their problems pains and sins, he welcomes, heals, and teaches them coming close to them. 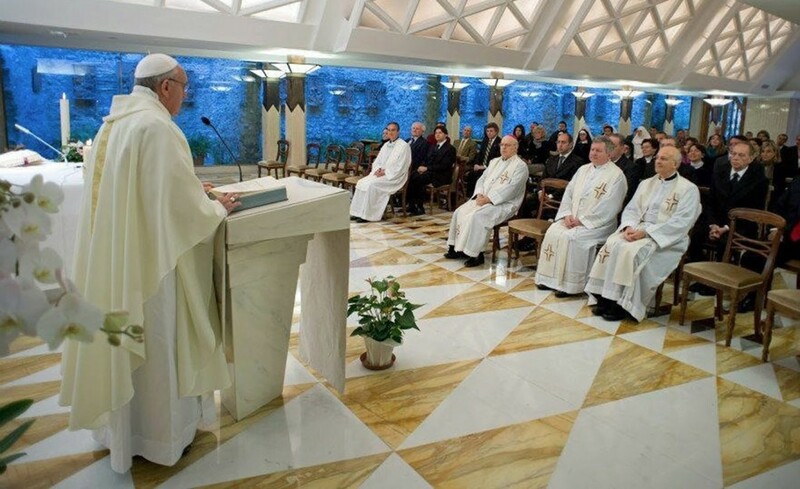 In the early days of the Bergoglian Occupation, I opined that exploring the Santa Marta homilies, wherein Francis often speaks without notes (i.e., from the heart) can be especially useful in getting to know who he truly is on the inside. He simply does not believe that Jesus Christ is God. It’s Catholicism 101, folks; the fact the He is God, and this alone, is what give Jesus authority. It also happens to be what gives Jesus credibility; making Him worthy of belief. Francis, however, does not believe in the Divinity of Christ. With this being so, is it any wonder that he does not believe the doctrines taught by the Church that Jesus established? What grants authority to a pastor or awakens authority in him, given by the Father, the Pope said, is closeness – closeness to God in prayer. A pastor who does not pray, who does not seek God, he said, cannot be close to the people. And a pastor detached from the people cannot bring his message to them. This double closeness is what the anointing of the pastor consists in, because moved by God’s gift of prayer, the pastor in turn can be moved by the sins, the problems and the diseases of the people. Relative to his obvious disbelief in the Divinity of Christ, this may appear as a small matter. With respect to what the future under Francis may hold, it is perhaps more noteworthy. Look, Francis isn’t going to promulgate a decree plainly declaring that Jesus Christ is just a man. The puppet master pulling the Bergoglian strings is far too subtle for that; indeed, more subtle than any of the beasts of the earth which the Lord God had made. What we may very well expect him to do (should God allow), is to push forward initiatives ordered on the false notion that the authority to engage in priestly ministry is simply awakened in an individual by prayer, provided only that there is a willingness to be close to the people. And what might such initiatives look like? Oh c’mon! It’s just one homily from a pope who does not communicate in precise theological language! If what Francis said a few weeks ago sounds familiar, there’s a reason; it’s part of a theme that he has been developing for some time. Jesus served the people, He explained things because the people understood well: He was at the service of the people. He had an attitude of a servant, and this gave authority. On the other hand, these doctors of the law that the people… yes, they heard, they respected, but they didn’t feel that they had authority over them; these had a psychology of princes: ‘We are the masters, the princes, and we teach you. Not service: we command, you obey.’ And Jesus never passed Himself off like a prince: He was always the servant of all, and this is what gave Him authority. Jesus never passed Himself off like a prince who issued commands? So much for the prophecy of Isaiah (see Isa 9:6), the very words of Our Lord concerning His Kingship (see John 18:36-37) and the all-encompassing nature of His authority (see Matthew 28:16-20). In fact, forget the whole of Sacred Scripture! They [the Pharisees] were detached from the people, they were not close [to them]; Jesus was very close to the people, and this gave authority. Those detached people, these doctors, had a clericalist psychology: they taught with a clericalist authority – that’s clericalism. Certainly, there is nothing altogether new in this assault against Christ the King and the sacrament of Holy Orders. He [the priest] now appears as nothing more than a Protestant minister. While the offenses against the Faith under discussion here are not new, what is new is the presence of a notorious public heretic who, in spite of numerous proofs to the contrary, is widely accepted by the naïve and the weak as a legitimate pope. Under the guise of papal authority, this man, Jorge Bergoglio, is Hell bent (literally), determined and willing to carry the revolution forward in a most unprecedented way, and barring Divine intervention, rest assured, he will continue doing just that. That's Francis in a nutshell. His ultimate objective; his one goal; what motivates him to get out of bed in the morning; what he has devoted his entire life towards: The destruction of the One, Holy, Catholic, and Apostolic Church of Our Lord and Saviour Jesus Christ.